What are you doing to improve food safety? Achieving food security goes beyond simply having enough food to eat. The quality, affordability and accessibility of available food are critical elements of food security. The reality is that greater emphasis has been placed on food availability at the expense of the quality (safety) of the same food. Kenyans are exposed to ever increasing cases of food borne diseases such as cholera. The cost of treatment is high and sometimes fatalities occur. 26 fatalities due to Cholera have occurred in 2017. In the same year over 3 million Kenyans were at risk of starvation due to drought, yet the country continues to produce and export fresh horticultural produce and experiences losses estimated at between 30-50% for horticultural produce. This is evidence of the need to address food safety and loss reduction issues in order to correct the disconnect that currently exists. Consumers are caught in the middle, and bear the direct burden of health care and higher food costs due to scarcity. Consumers must therefore be enjoined to efforts to improve food security through increased awareness and participation in driving demand for safe food as well as taking responsibility for food loss reduction. Food safety and loss reduction is vital to the achievement of food security and economic progress in Kenya in a number of ways. 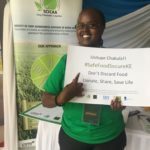 First, unsafe production, storage, transportation and processing of food can result in its contamination, contributing to its loss if it becomes unfit for human consumption and, therefore, directly affecting food security and livelihoods of Kenyans. Second, unsafe handling and processing of agricultural products may result in various hazardous and disease causing organisms contaminating the food, such as pesticide residues, aflatoxins and other mycotoxins, salmonella, etc., contributing to diseases such as cholera outbreaks, typhoid, hepatitis and cancer. Fourth, the 18-45% food loss in horticulture adds to the already existing food scarcity in Kenya. With food scarcity, the consumer buying power is lowered increasing food insecurity and lowering economic progress. 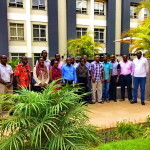 To achieve safer food and reduced losses for horticultural produce in the country it’s imperative to improve cohesiveness of food control systems through effective collaboration among public and private sector actors through policy harmonization and implementation at the county and national level. It is equally important to build the capacities of consumers to drive demand for high standards of food safety in the supply chain through functional consumer lobbies. To that end through the Voice For Change Project the Society of Crop Agribusiness Advisors (SOCAA) in collaboration with SNV Netherlands Development Organisation and other Civil Society Organisations are engaging with responsible institutions in the public sector as well as private sector supply chain actors, producers and consumer in efforts to address policy level challenges and increase collaboration from farm to fork.